The reason is because we are dealing with young lambic of less than 6 months old, which is a lively product. Its quality can still change under different conditions while in transport, due to change in temperature or the time it might take until delivery. The Cantillon bag-in-box is still available for local, immediate consumption (within a 2 week time frame). The process of change in old lambic stops once it passes the age of 6 months. 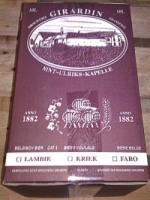 In fact old lambic can be kept for months in it’s cubitainer. Gert, the brew-master from Oud Beersel has some Lambiek bag-in-box in his fridge of more than 2 yrs old! Worth an experiment and see how the flavour changes? Why not? ?